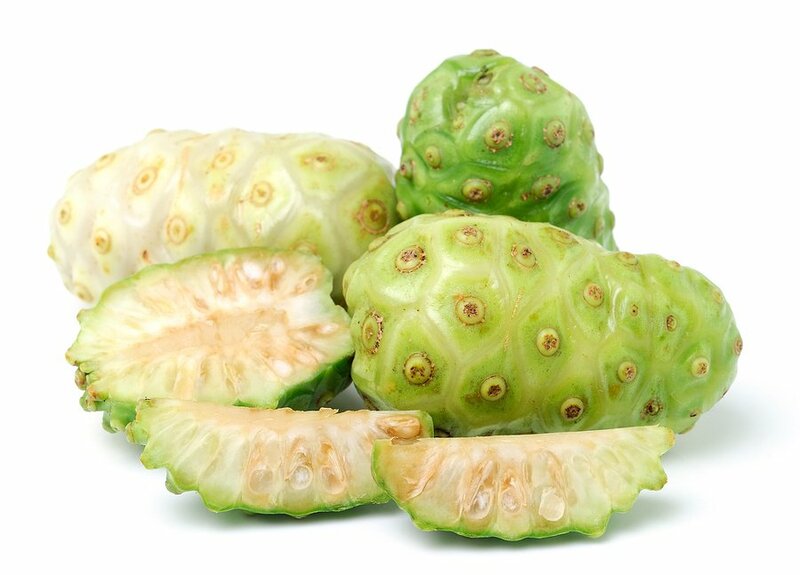 Noni (Morinda citrifolia L.) is also known as "Indian mulberry" because of its similarity to a true mulberry plant. The small trees or shrubs grow 3-6 (9-12 feet) meters in height and have large glossy leaves and small or medium-sized green fruit with dark seeds. Noni is native to Southeastern Asia and Australia and was introduced to Hawaii from Polynesia. It has been cultivated for the red dye in its bark, yellow in its roots, and for various medicinal uses of the bark, leaves, stem, roots, and fruit. It was also used historically for food during famines. Noni is considered a perfect plant, that is, it contains both male and female parts within it and can self-germinate. The fruit grows after the tree flowers, with a cluster of white flowers producing a noni fruit. Noni has been growing for thousands of years in Southeast Asia and Australia and is mentioned in ancient Indian medicinal texts. It grows well in coastal areas and can tolerate brackish or salty water. Noni can survive in conditions most other plants cannot, including growing up through cracks in lava and during dry, drought-like conditions. All parts of the noni plant have been traditionally used for various purposes including both medicinal and food-based. Leaf - noni leaves were used to wrap meat for cooking, to feed livestock, burns, headaches, and fever. They were also made into teas, used as poultices for sprains and bruising, fever, stings, bone fractures and to treat tuberculosis. Leaf extracts were used for hypertension, stomachache, diabetes, urinary tract problems, and hernias. Fruit - noni fruit was used in both ripe and unripe forms. Unripe fruits were applied to sores around the mouth, while ripe fruits were used as a throat gargle, to treat intestinal worms, and for cuts, wounds, abscesses, mouth and gum infections, toothaches, ulcers, for food during famines, and for pig food. Juice from the fruit was used as a laxative. Stem - noni stems were used to build canoes, paddles, ax handles, digging sticks, firewood, and for their red pigment. Seed - oil was extracted from noni seeds as a scalp insecticide and insect repellent. Root - noni roots were used in carving and for their yellow pigment. Noni fruit has had many uses and continues to be used by many people today. Today, noni is used as an alternative medicine treatment for many different health conditions including joint disorders, digestive problems, gout, hypertension, infections, inflammation, sinus and asthma conditions, ADHD, addictions, acne, and hair loss. In addition, human clinical trials at the University of Hawaii's Cancer Research Center have just been completed in late stage cancer patients that have preliminarily shown improvement in pain levels and quality of life for some patients. Final results may give scientific credence to some of the health claims that have been made about noni for centuries and even longer. All of Biconi's products including our line of face products and hair care products contain noni for its beneficial effects on hair and skin health.